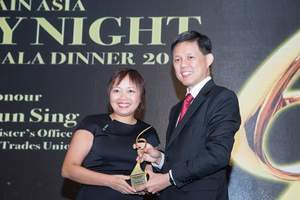 SINGAPORE--(Marketwired - Nov 17, 2017) - At the 2017 Supply Chain Asia Awards held last evening, Pang Mei Yee, Vice President and Head of Innovation, Solutions Delivery and Service Management for DHL Asia Pacific, was named Supply Chain Woman of the Year for her consistent track record in driving innovative logistics practices throughout the region. The prestigious accolade recognizes women who have excelled in the supply chain sector and have demonstrated initiative in driving the industry forward. "I'm honored to receive this award as testament to the tireless commitment of the Asia Pacific Innovation Center team in promoting how businesses can apply the latest logistics innovations in the here and now," said Pang about winning this award. "The innovation center has sought to demonstrate how to turn disruption into constructive results for Asia's logistics industry -- testing and exploring new technologies like IOT, autonomous and collaborative robots and advanced analytics -- and it's exciting to see our work recognized as leading the way for logistics professionals in Asia Pacific." DHL remains committed to spearheading innovation across Asia, with its recent major investments on its South Asia Hub, Advanced Regional Center (ARC) and Asia Pacific Innovation Center (APIC) in Singapore -- all of which are showcases of automation, electric vehicle technology, and other logistics innovations. The Supply Chain Asia Awards 2017, which takes on the theme of innovation this year, aims to recognize companies that have made the initiative to invest in innovative strategies and adopt effective technologies. DHL is the leading global brand in the logistics industry. Our DHL family of divisions offer an unrivalled portfolio of logistics services ranging from national and international parcel delivery, e-commerce shipping and fulfillment solutions, international express, road, air and ocean transport to industrial supply chain management. With about 350,000 employees in more than 220 countries and territories worldwide, DHL connects people and businesses securely and reliably, enabling global trade flows. With specialized solutions for growth markets and industries including technology, life sciences and healthcare, energy, automotive and retail, a proven commitment to corporate responsibility and an unrivalled presence in developing markets, DHL is decisively positioned as "The logistics company for the world."